We all know that blue a furry monster from Sesame Street that eats all the cookies. This t-shirt is how cookies see this blue creature. 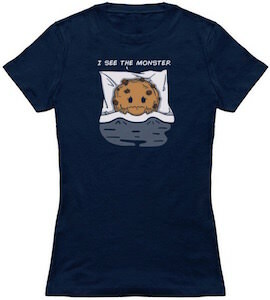 On the shirt you can see a chocolate chip cookies trying to fall a sleep and it says “I see the monster” right above it and yes for a yummy cookie that has to be a traumatic experience. You can get this sleepy cookie t-shirt in men and women’s styles in the colors black, charcoal and navy blue. You can pick a size between Small and 6XL and all are made from 100% cotton so that they fit and feel just right. On this t-shirt find a fun mix of two characters, first you have the head and face of Bert from the classic children’s television show Sesame Street. Next find Bert decked out in the famous hat and sunglasses that Heisenberg (Walter White) wears often on the television show Breaking Bad. The two characters Bert and Heisenberg mixed together and you get the name which is also printed under the image “Heisenbert”. 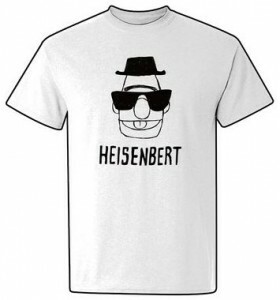 You can get this Heisenbert t-shirt in a wide variety of sizes for different style shirts, find a men’s, women’s and youth styles all made to be durable and comfortable and many t-shirt colors to choose from. Get this classic funny Heisenbert T-Shirt. Sesame Street meets Pulp Fiction. Bert and Ernie are starring in a new movie but I don’t think this one will be for children. 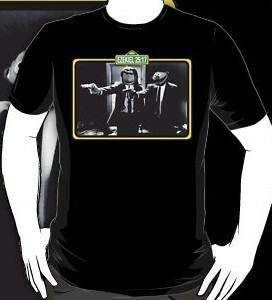 Check out this awsome t-shirt features the face of Bert and Ernie on two Pulp Fiction characters in one of the movies classic scenes. Both of them holding up guns with a seriously deranged smirk on their face. This t-shirt is 100% cotton and is very durable and super comfy, you can get this print in a huge variety of colors and sizes also check out the different cool styles of shirts. Find your Pulp Fiction Bert And Ernie T-Shirt.